Welcome to ‘France et Moi’ where this week I am talking to author Liz Ryan about what France means to her. 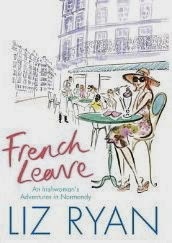 Liz has lived in Normandy, France since 2001 and is the author of several novels and a memoir about her life in France, French Leave that you can read my review of here. She especially enjoys walking and spending time on the beach. Liz: Its strong sense of identity – (language, culture, architecture, food, fashion, wine) – its seasonal rhythm – its social rhythm - and of course its hypochondria! Liz: I was an 18-year old au pair in the Loire Valley. Absolutely hopeless, but the family couldn’t have been nicer, even when I nearly poisoned the baby…which was when I realized I’d better seriously learn the language, so I could spend the rest of my life apologizing for not understanding crucial instructions. I also discovered the music of Serge Reggiani, which I love to this day. Liz: Just go for it. Be confident, and concentrate. Watch French tv and, especially, listen to radio, which trains your ear until one day, bingo, you can follow what’s being said. Attend classes, and don’t hide out with other ex-pats. Speak up no matter how horrible a hash you might make of it. As with playing the piano or tennis or whatever, personal ability varies, but anyone who’s lived more than 2 years in France should be able to communicate fearlessly. 4) When you first arrived in France what was the best thing about being immersed in French life and the scariest thing? 5) France has some beautiful cities and there are a few that constantly battle to be my favourite, what is your favourite French city and why? Liz: It’s a cliché but it’s Paris. Even today, submerged in fast food joints, plastic signage and fusspot over-regulation, it still has that old je ne sais quoi. You just have to seek it out a bit harder. If I were the new mayor, I’d start by enforcing a return to the lovely old script signage on shops. I’d also ban rap music in restaurants – bring back the accordion! 6) Every region in France has it’s own culinary specialty, do you have a favourite Norman dish? Liz: Seafood. I buy my fish fresh off the trawlers along the Cote d’Albatre and there is no happier moment than sitting down outdoors with a plate of fresh oysters, a chilled glass of white wine, a warm baguette and some unsalted butter. I love cooking the day’s catch at home too, whatever it might be – sole, turbot, whelks…the freshness so fabulous, all you need is a whoosh of lemon juice and wow, magic. Liz: I guess I would be the 'salty and serious Roquefort' ! Liz: Depending on mood and budget, either a café au lait or a glass of champagne. Liz: Calvados keeps us warm and hardy here during the Norman winters – perfect for snuggling up with beside the fire on a snowy night (and there were a lot of those in 2013!) Some of the locals make calva and some of it is so rich, so full of depth, mmm. I also love crémant and would in fact prefer a good crémant to a bad champagne. My favourite is Ackermann. 10) Can you describe your perfect French apero for us; the drink, the nibbles, the location and the company? Liz: The drink would be either champagne or crémant; the nibbles would be olives stuffed with almonds, tiny chili peppers stuffed with cream cheese, salt crackers and home-made humous; the location would be by the sparkling sea and the company would be warm and witty! It would also be either totally bilingual or totally monolingual, because after 13 years in France I’ve run out of patience with interpreting, especially for anglophones who live here permanently. It slows the simplest chat down to first gear and means no lively conversation can fully develop. You also get a sore neck from playing tennis umpire: ‘He says to tell you…she says to tell him…’ etc. Liz: I’m trying to decide whether to return to writing fiction or do some more journalism such as French Leave . They’re very different skills but I love them both.